Showing results for tags 'bear'. 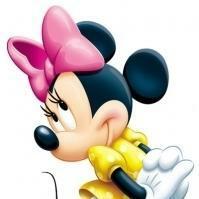 Love is not only feelings of boy to girl and vice versa. 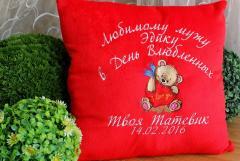 Parents also love their children very much and this nice bright cushion is good example of it. 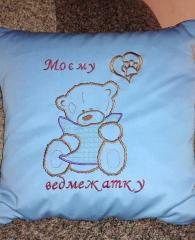 It is made by mom to her little boy to remember him about her feelings. It can be good gift for Valentine’s day or other holiday. 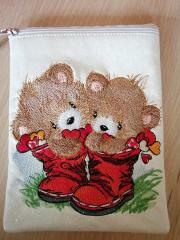 It is decorated with Teddy Bear with Heart embroidery design. 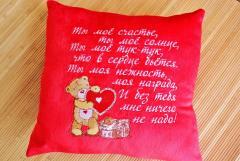 This is pleasant and soft cushion which is more memorable souvenir than interior detail. It is prepared as handmade gift for Valentine’s day. 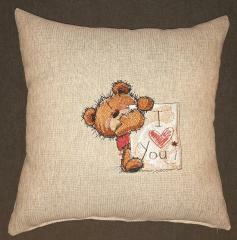 Its surface is decorated with Teddy bear I love you 2 embroidery design. 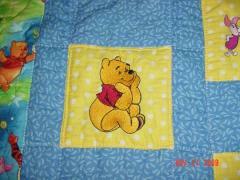 It is figure of little bear which holds pillow in form of heart in its paws. This pretty sample is added by touchable rhymes. 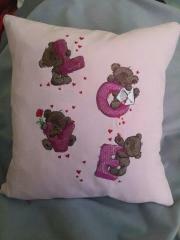 This is bright and soft cushion which is prepared by wife to beloved husband. 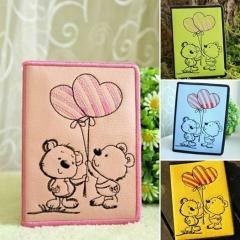 Its color reminds about strong feelings and its front side is decorated with Teddy Bear with Heart embroidery design. Furthermore it is added by thematic inscription which mentioned the special date. So it is clear that this work piece was designed as original gift for Valentine’s day. There are two kitchen serviettes with Teddy designs. They are very pretty due to Teddy with watering can machine embroidery design and Cute Teddy Bear machine embroidery design. 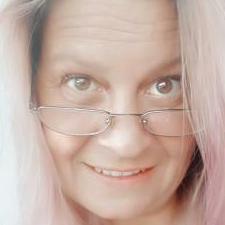 They please all members of your family but children love them especially. Now you don’t need to call them to eat for long time: they come fast to see their favorite kitchen accessories! This is pretty photo of nice soft pillow. 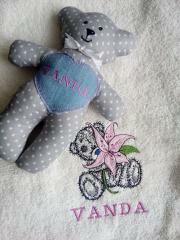 It was created as souvenir for young parents who have just got little girl. They gave her beautiful name which means Wisdom. 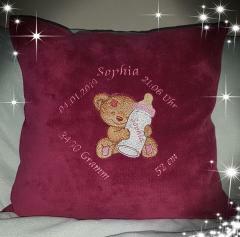 But now she is still little baby so this work piece is decorated Favorite baby bottle embroidery design. This funny picture is added my important information about her birth. 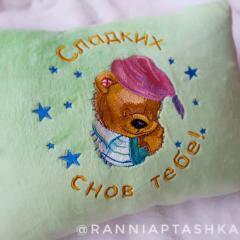 This is embroidered cushion prepared by Ivanna Monchak as gift for little beloved boy. It is decorated with warm inscription and two samples underlining author’s feelings. These pictures are Sad teddy applique machine embroidery design and I love animals free embroidery design. 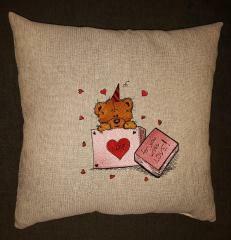 Please note original combination used by author: Teddy bear on this picture also keeps little pillow in its fluffy paws. 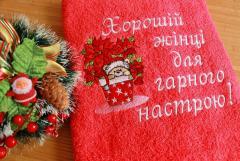 This is pretty terry towel prepared by Kreativnaya Shtuсhka as Christmas gift for nice woman. It is clear from embroidered inscription on it. 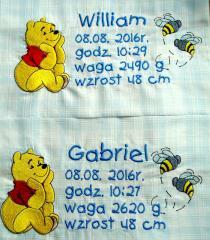 It is added by the thematic embroidery sample. It is Who is hiding in the pot? embroidery design. It is not difficult to answer this question, right? Just look at this pretty little bear which is looking from the pot right at you! 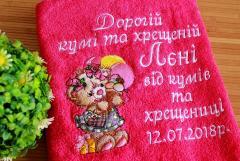 This is fragment of pretty terry towel prepared by Kreativnaya Shtuсhka for her friend. She decorated this work piece by thematic inscription and Who is hiding in the pot? 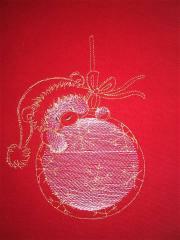 embroidery design. This picture has suitable color scheme for background fabric. 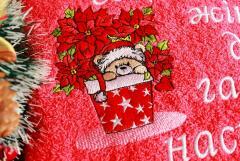 Here you may see curious muzzle of little bear sitting in Santa’s cap inside festival pot with bright flowers and leaves.